Attix 19 AE Water Evacuation Vacuum - Lightly used display model at a deep discount. 1 available at this price. Details - 1000w vacuum with a discharge pump mounted in the canister for automatic water evacuation. 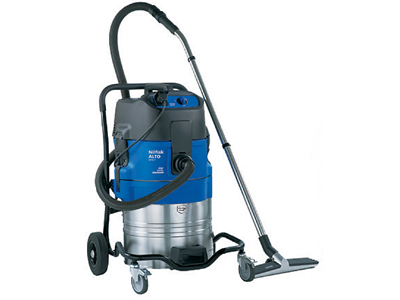 Will also function as a normal vacuum without running the pump. This model will pickup 1 gallon per second of water and discharge it up to 23' vertically (dynamic discharge head) or 300' horizontally. Great for fire departments or flood/fire restoration contractors. Homeowners can use these to empty and clean their pond or swimming pool. This unit comes with a 1 1/2" x 13' oil resistant hose, curved wand and extension tubes, and a 16" wide commercial squeegee. Suggested List Price - $3,725.21. This vacuum cannot ship for the $10 flat rate amount. Please call or email your zip code for a freight quote. Additional $50 discount for local pickup (in NJ).